Glenavon and Dungannon Swifts shared the spoils at Mourneview Park last night as both sides failed to sparkle. It was the home side took the lead in the first half through Bobby Burns before an 84th minute strike from Paul McElroy got a share of the spoils for Rodney McAree's side. 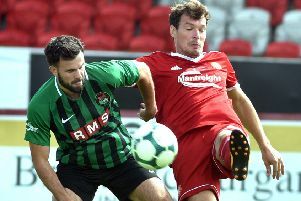 Gary Hamilton will be disappointed with his team's display, while Rodney McAree will be pleased to get something from the encounter, that will not live long in the memory. The game started at a good pace with both sides pushing for the opener - with the Lurgan Blues hitting the post just after kick-off. As the rain poured down Glenavon went looking for the opener but for the time being the Swifts defence was watertight. After 15 minutes it was still scoreless and there was little between the sides but Burns was looking lively up-front for Hamilton's side. The Swifts were doing well and they seemed to be lifted after last weekend's 1-1 draw with Crusaders at Seaview and were trying to push forward but their final ball was just not on the money. Glenavon boss Hamilton also seemed less than happy with is side's showing as he came off his bench to have words with Rhys Marshall in the 25th minute. Dungannon's Douglas Wilson then tried his luck from long range - but his effort was well off target. It was still scoreless after 30 minutes as both sides failed to create anything of any quality and neither goalkeeper had been really tested. We needed some kind of spark to bring this game alive - but where would it come from? Moments later Ryan Mayse should have put the Swifts ahead. He raced clean through only to be stopped by Glenavon goalkeeper Jonathan Tuffey. It is not the first of last time Tuffey will come to his side's rescue. The opening goal came in four minutes before the break after good work by Glenavon's Marshall. The ball found Burns and he made no mistake from close range to make it 1-0. It was a good finish from the teenager. It should have been 1-1 just before on the whistle as Chris Hegarty somehow failed tom connect with a free-kick with Tuffey stranded. The first 25 minutes of the second half was scrappy with both sides failing to create a clear cut chance but the Swifts would have been happy as they were still very much in the game. With 15 minutes left is was very much game on and the next goal would decide what way this match was heading. Andrew Mitchell tried his luck in the 78th minute. His long range effort however was well off target. Then to the shock of the home support it was 1-1 in the 84th minute as McElroy hit an unstoppable shot from outside the box that flew past Tuffey in the Glenavon goal. It was a fantastic finish from McElroy who had put himself about all night but Glenavon will have been disappointed to concede so late on. Glenavon: Tuffey, Burns, Kelly, Doyle, Marshall, Mitchell, Hall, Sykes, Clingan, Fole, Singleton. Suibs: Griffan, Patton. Marron, McGrory, Jenkins. Dungannon Swifts: Addis, Hegarty, Wilson, Armstrong, Mayse, McElroy, Harpur, Taggart, Lowe, McMenamin, Burke. Subs: Fitzpatrick, McMahon, O'Rourke, Clucas, Coleman.